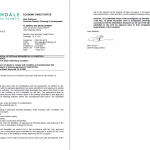 Due to the sensitivity of the end users of the proposed development and the information held y the local authority on the history of the site a contaminated land planning condition was attached to the decision notice for the application for the erection of a pair of semi-detached houses. 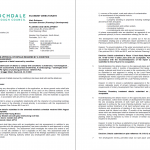 Demeter Environmental were commissioned to prepare the desk study report in order to identify any potential issues on site relating to historical contamination and to determine the scope of any further works. 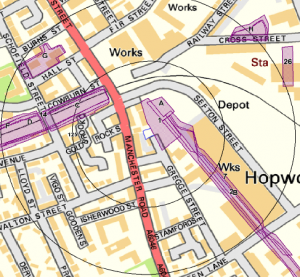 The first stage was to review the historical Ordnance Survey maps for the site, which revealed that the site formed part of a coal wharf with a tram line running through the site, was adjoining a wharf and was in close proximity to a cotton mill and iron works. A reservoir was identified to the north east of the site which was in-filled circa 1983. Environmental data procured for the report identified ground workings adjoining the site as well as numerous workings within 250m of the site and a landfill 100m east. 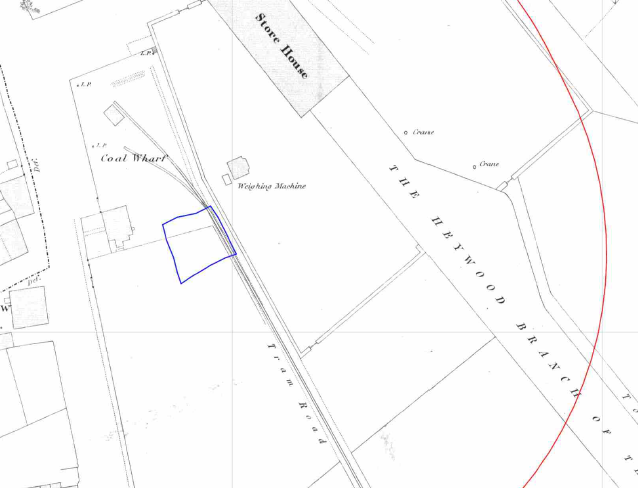 The data also revealed that a coal yard adjoined the site. Data provided by the Environment Agency confirmed that there were no landfills within 250m of the site, contradicting the environmental data procured. A qualitative risk assessment was undertaken on the potential sources of contamination identified to determine the risk posed by the potential source, which discounted the nearby mills and works and potential sources of contamination, leaving the on site sources, the landfill 100m east and the in-filled reservoir. In order to investigate the potential issues relating to impacted soils on site a site investigation was proposed. Given the moderate/low risk posed by the off site sources of ground gases the options of ground gas monitoring or incorporation of gas protection measures in lieu of further investigation were proposed. 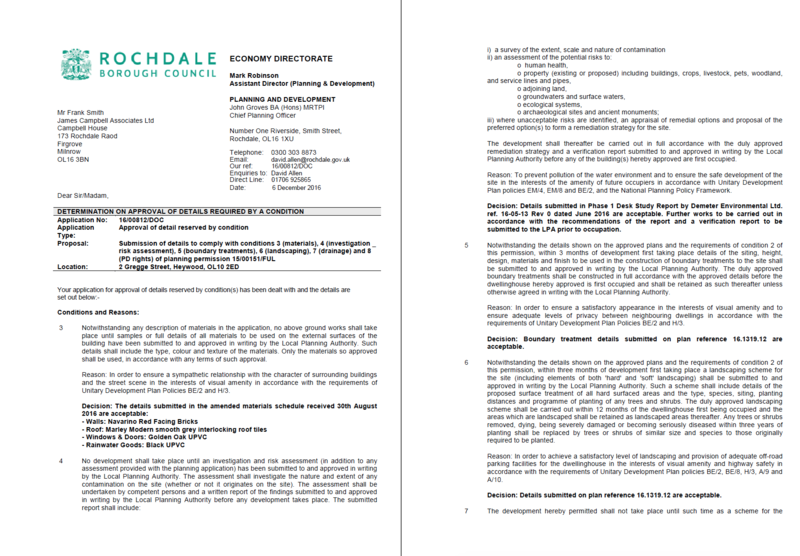 The desk study report was formally submitted to Rochdale Borough Council as part of planning application 16/00812/DOC, which was accepted (see the decision notice). Demeter Environmental were commissioned to undertaken the phase II works in November 2016, which comprised of the excavation of three trial pits. The recorded geology comprised of a clayey topsoil with gravel of brick to approximately 0.85mbgl. Samples from each trial pit were taken and analysed to a broad suite including calorific value ot determine if coal dust was present. Ground gas monitoring was not undertaken as the client had determined that the incorporation of gas protection measures was the preferred option. 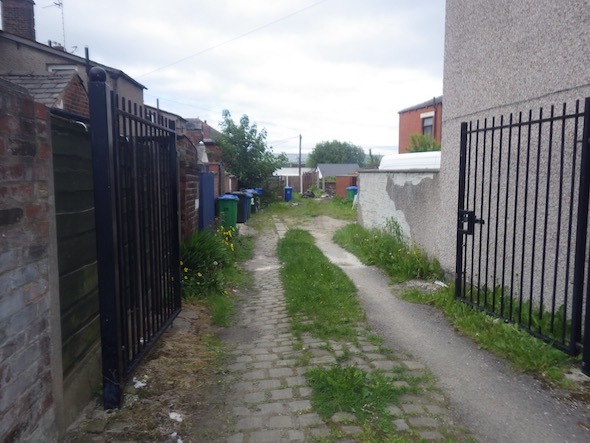 Whilst the chemical analysis indicated the site soils were impacted by lead, arsenic and a number of polycyclic aromatic hydrocarbons as well as beryllium there was no evidence of coal dust in the site soils. In order to break the pollution linkages associated with he site soil it was proposed that water mains should be specified as barrier pipe and a 600m cover underlain by a geotextile is placed on garden and landscaped areas. 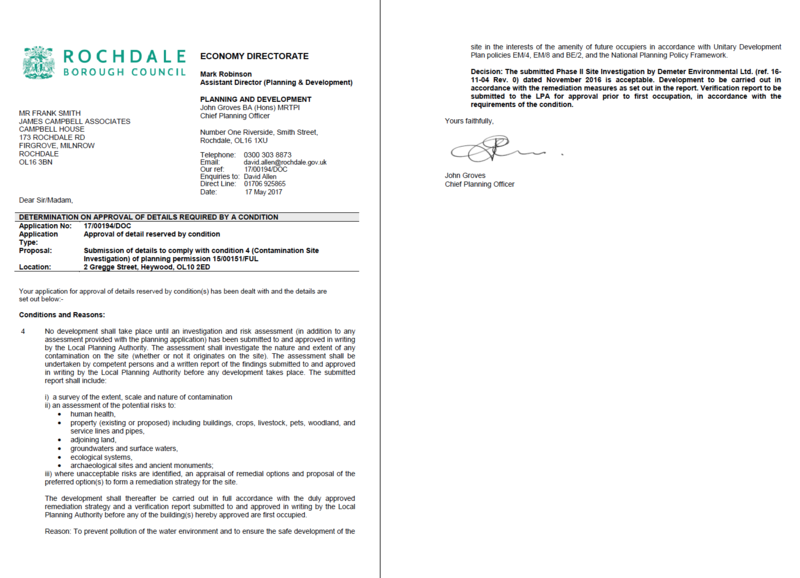 The desk study report was submitted with planning application 17/00194/DOC, the decision notice confirms the Phase II report was accepted and that documentation demonstrating the remediation has been undertaken will be required.